The only nice person on the JagWire staff. Where is CHS Hall of Fame Now? Where do you go to school now, and what major are you pursuing? I am starting my 5th year in the MD/PhD program at Ohio State University in Columbus, OH. I am working towards a PhD in neuroscience. My project focuses on immune responses to traumatic brain injury. Prior to coming to Columbus, I attended Oberlin College (Oberlin, OH) and graduated in 2013 with biochemistry and neuroscience majors. What sport did you play in high school, and what were your biggest athletic accomplishments as a Jaguar? At Carrboro, I ran cross country and outdoor track and also swam. This isn’t quite an athletic accomplishment, but being able to help start the cross country and track programs from scratch was a very special experience and a lot of fun. We came a long way in the first two years, and the teams have won multiple state championships since then, so it is cool to see how far the program has come. Have you continued to pursue your sport in college? If so, how? What is the most major difference between sports in college versus high school? I did! I ran varsity cross country and track all four years at Oberlin, which is a Division III program. College sports are a much bigger commitment. Practices and traveling to competitions take up more time, but you also have to make more sacrifices in terms of social time and breaks. Despite putting a lot of time into college sports, it was absolutely worth it. My college teammates are still my closest friends and we share so many special memories and accomplishments with each other. 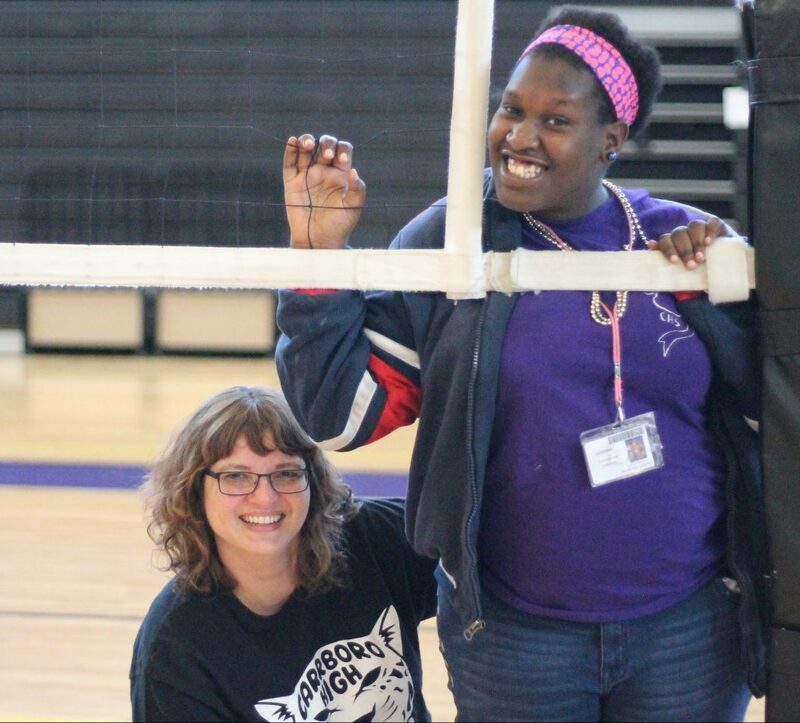 What is one of your favorite sports memories from your time at Carrboro? My first year at Carrboro, I was the only cross country runner from our team who ran in the state meet. The following year, we had a full team qualify to run. After having run alone, running with the team was that much more special. We also always had a blast at summer cross country camp in Brevard, NC and I have a lot of great memories from camp. I attend the University of Michigan—Ann Arbor where I am going into my sophomore year studying civil engineering. I played lacrosse at Carrboro. My biggest athletic accomplishments include Regional Champion, Academic All-American, 2-year Captain, East All-Region in 2016, HM All-State in 2016, All-Conference in 2016, and 2016 Conference-6 MVP. I am not playing lacrosse in college but I am an intramural flag football champion at UofM! Beating Chapel Hill to win the regional championship my senior year was awesome. The stands were as filled as I had ever seen them and it was a defensive battle (we won 4-2). I played defense so that game was especially fun for me. Not to mention Chapel Hill is a huge rival of ours. I am a rising senior at Rhodes College in Memphis, Tennessee. I am an Anthropology/Sociology major. I am pursuing a career in pediatric oncology nursing after I graduate from Rhodes in 2018. In High School I played three sports: field hockey, swimming and lacrosse. I pursued field hockey ultimately and am still playing at Rhodes College on their varsity team. My greatest accomplishments during my time at Carrboro was I was named the Impact Player for the 2013 field hockey season. I was a captain my senior year (2013) and was a recipient of the Iron Jaguar award for the year 2011, 2012 and 2013. I have continued to pursue my field hockey career in college. I have been a starter for the Rhodes College Field hockey team since I was a freshman.The major difference between high school sports and college sports is in high school I was playing field hockey constantly. I played around 80 games a year and now in college I can play at most 30 games. For me every game is special because I know they are limited. I have gained such a respect for myself as an athlete and my teammates and coaches because we put so much time and effort off the field for our games that I did not do near as much in high school. My favorite memory from Carrboro Field Hockey was watching my best friend, Katie Wilson, take a stroke during double overtime with East Chapel Hill High School. Katie was at the time injured with an ACL tear and watching her make the stroke and helping us win the game was such an amazing moment. It also was so sweet to beat East at Carrboro for the first time in school history. At 11:30 pm on Monday, April 3, thousands of people poured onto Franklin Street in celebration over the UNC Men’s Basketball team’s win over Gonzaga in the NCAA National Championship Game. With a score of 65-71, the Tar Heels claimed their sixth national title. In a tournament with match-ups between the top 68 collegiate basketball teams in the country, the NCAA tournament is better known as March Madness to many, including a majority of the CHS student body. According to a survey sample of CHS students, at least two-thirds of students followed the 2017 NCAA tournament in some form. 20.6 percent of students admitted complete devotion to making brackets and watching in angst as the unlikely team (Xavier) took down the favorite (Arizona). However, another 23.5 percent of students had no clue what March Madness even meant. 62.5 percent of CHS students correctly predicted UNC’s tournament success. A win over the Gonzaga Bulldogs meant redemption for the Heels after losing to Villanova by three points at the buzzer in 2016. Only 5.9 percent of students foresaw the Gonzaga Bulldogs’ first ever national championship appearance, and no student thought Gonzaga would be named 2017 National Champion. 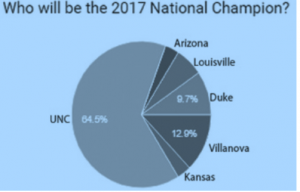 The most common predictions for NCAA Men’s Basketball Tournament winner after the Tar Heels were reigning champion Villanova and Duke. Both Villanova and Duke ended their championship hopes earlier than expected this year with respective losses to Wisconsin and South Carolina in the second round, shattering brackets all across the country.
. CHS students predicted which NCAA team they thought was going to win the tournament. 64.5% of them predicted it right. Photo courtesy Google Docs. Although Duke’s meager performance in the NCAA disappointed many fans in the CHS community, the Duke and UNC Basketball programs have each earned one national title in the last three years, continuing their legacies of dominance in men’s basketball on the national stage. As Carrboro lies within a 14 mile radius of the both universities and basketball rivals, it is no mystery as to why many students make bets for the best bracket and sport the colors of their favorite team each year throughout the month of March. 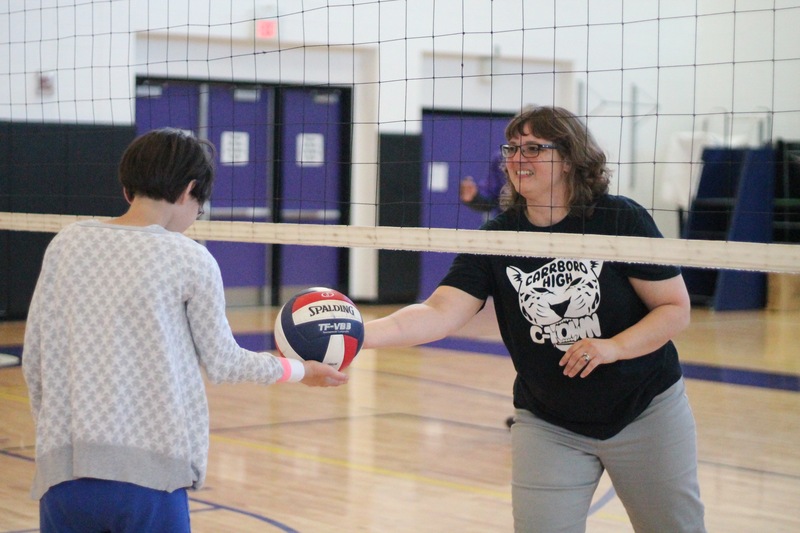 Recently, Carrboro awarded the Teacher of the Year title to Melissa Barry. In Barry’s sixth year teaching at CHS, she finds this award a true honor as it represents a place and profession that are both close to her heart. Some spend all their lives searching for their true passion or calling in life. For Barry, she always knew she wanted to become a teacher. “When I walked into my first day of preschool in the Bronx, I knew that [teaching] was what I wanted to do for the rest of my life,” said Barry. Barry received her undergraduate degree in psychology from Rutgers University in New Brunswick, NJ and went on to earn a Masters in Parent Education and Family Support from Wheelock College in Boston, MA. Her career in teaching began with early childhood education and elementary education, and Barry now finds her love for teaching in special education at CHS. In working at CHS, Barry most appreciates the sense of community. According to Barry, everyone possesses valuable qualities and skill sets, and Carrboro’s close-knit community provides the ability to nurture this sense of value through education. “To me, that is what education is all about: the ability to foster a sense of com- munity,” said Barry. In all professions and paths of life, people learn from role models or sources of inspiration that help shape their interests and who they become. Two of Barry’s most significant role models include her first grade teacher and her high school calculus teacher. To this day, she can recall their first and last names without hesitation, demonstrating the impact both teachers had on Barry as she pursued her passion in education. Barry loves that teaching is full of creative license with priceless opportunities to develop something new every day. In her six years at Carrboro, Barry has only repeated one lesson plan, truly maximizing her use of creativity in teaching curriculum. With her accomplishments in teaching, Barry continues to work toward new goals to improve her teaching as well as the overall learning environment at CHS. The costume designers in the spring production of Cinderella, including seniors Aria Margulies, Grace Schneider and Jewel Thompson, worked hard behind the scenes. Their expertise in sewing and costume design reaches far beyond the theatrical stage, however. According to Thompson, the seniors’ interests in costume design and piecing together outfits sparked during sophomore year when the three made costumes in honor of the Avengers for fun. As part of this year’s costume design team, Margulies, Schneider and Thompson converted donated prom dresses into Victorian-style ball gowns to fit the setting of Cinderella. The process of making each gown for the play began with a base fabric before being fit to a model. After envisioning a unique design for the costume, costume designers sewed on different fabrics to alter the style of the dresses. The final step in the process of costume design involved adding embellishments such as ribbons and bows. Thompson discovered her interest in fashion and clothing design while baking a cake. She wanted to design an outfit for a character that would serve as a cake-topper, inspiring Thompson’s love for fashion design that she continues to pursue as a hobby. Currently, Thompson most enjoys making skirts and using bold color schemes in her design patterns. Margulies, who served as assis- tant designer for Cinderella, has always loved princess-style dresses. Although she described her first attempt at sewing as terrible, Margulies improved by making countless different items, including her own dress for the CHS Snowball dance. She spends her time working on different sewing projects, especially historical costuming. Currently, Margulies most enjoys making corsets. Cinderella marks Margulies’ fourth production working with costume design at CHS. While she’s had experience working for the costume department before, Margulies hadn’t ever tackled a project this big. Margulies was tasked with designing a dress that would transform from a drab servants’ dress into a beautiful dress, fit for a ball. “Cinderella’s dress is the biggest thing I’ve ever worked on since it’s going to transform on stage,” said Margulies. For it to work, Margulies had to create patterns derived from ideas put together from a myriad of instructional youtube videos. Schneider learned how to sew at a young age, around the same time she learned to do other household tasks such as cooking. Since then, she continued to sew and contributed her talents and knowledge to help out with Carrboro theater productions. Schneider helped with more than just sewing for Cinderella by picking out materials that go into other costumes, like the horses’ heads. “It’s something I enjoy doing,” said Schneider about costuming. All three CHS seniors plan to pursue their love for sewing and costume design after high school, either as a career or a hobby. 20 Carrboro High School representatives competed at a Distributive Education Clubs of America event on December 15 in Sanford, NC. While DECA may sound foreign to most, DECA is an expanding club of 37 students at CHS. Prior to a DECA competition, each competitor signs up for a category that sparks their interest within one of five different career clusters: Business Management and Administration, Entrepreneur- ship, Marketing, Finance or Hospitality and Tourism. There are about 55 potential categories to specialize in. Categories and competitive events range from Retail Merchandising to Sports and Entertainment Marketing to Human Resources Management. According to Julie Francis, club advisor for DECA and Honors Strategic Marketing teacher at Carrboro, students take a test on their field of focus and participate in a role-play during the competition. During role-plays, DECA competitors must present to a panel of judges how they would handle a certain real-world situation relating to their field of expertise. The judges evaluate and score each competitor’s presentation based on various factors. A combination of scores from both the written test and role-play determine an overall score. “We had a great time. It was wonderful to see the students so passionate about this [program],” said Francis. Five CHS students earned a total of eight honors or awards in a variety of categories at the December competition in Sanford. Juniors Pierre Perrin and Kirby Thornton placed in the top ten for their category’s written test. Junior Cole Phillips and seniors Taylor Gosk and Mackenzie Linstead earned overall scores in the top ten. Thornton placed third overall out of a pool of about 400 competitors. “My favorite part of DECA is that it brings out confidence in even the shyest members. While you’re competing, you take on the role of a professional member of society, but it’s more like becoming a better version of yourself,” said Thornton. The purpose of DECA is to develop future leaders and entre- preneurs by equipping students with tools for success in the real world. 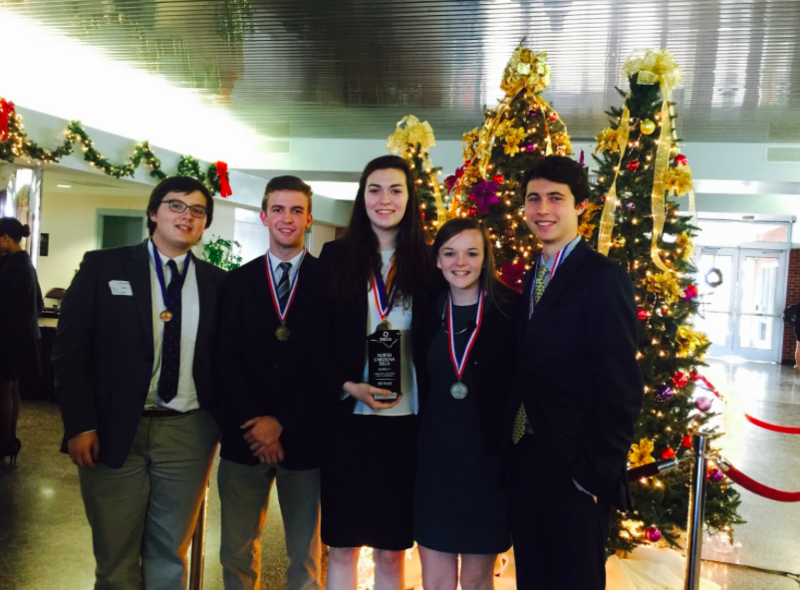 The DECA Club at Carrboro is just one of a network of 3,500 high school programs and 275 collegiate programs worldwide, totaling more than 215,000 members. As CHS continues to expand in its student involvement with DECA, Thornton emphasized that the club is open to anyone. No experience with CTE subjects is required to become a DECA member. 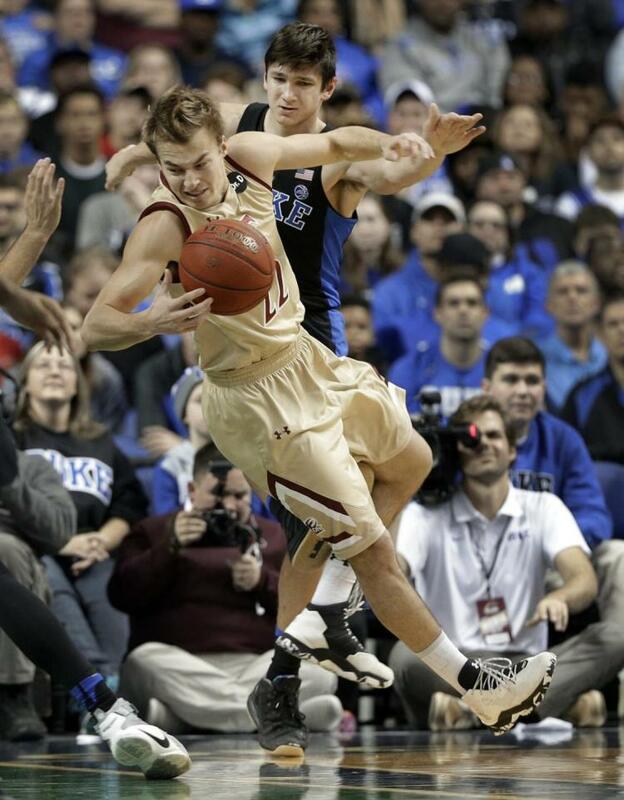 April 6, 2015: Grayson Allen becomes one of the most well-liked and highly lauded freshman collegiate men’s basketball players in the nation as he drops 16 points to lead Duke to a victory in the National Championship game against Wisconsin. December 21, 2016: Allen becomes one of the most hated players in college basketball as he receives a technical foul for tripping an opponent during a game against Elon. Going into his sophomore season, Allen ranked highly until two tripping incidents lessened his accomplishments on the court. Now in his junior year, Allen’s talents have been largely undermined by his alleged sportsmanship infractions. His credibility suffered a third blow most recently on December 21. Allen received a technical foul for tripping an opponent during a game against Elon. ESPN aired footage of Allen being restrained by team managers in response to the technical foul call. After this third offense—followed by an unprecedented tantrum on the sidelines—Allen was suspended for one game before returning to his position on the Duke Basketball team. Coach Mike Krzyzewski also stripped Allen of his captaincy. The issue of sportsmanship led to consequences in regard to Allen’s actions. CHS track and field coach Melvin Griffin believes that sportsmanship speaks to a person’s character, including family values passed down through generations. “Sportsmanship represents the way you hold your name, the school name on the front of your jersey, the name on the back, your teammates and your family,” said Griffin. Sportsmanship may also hold roots in team performance. Following the Elon game and Allen’s suspension, the Blue Devils went on to lose their next four out of seven games. This period of rough losses pushed Duke down to sixth in the ACC after being ranked as the top team nationally in a CBS preseason ranking. Duke’s struggle has come both around the time of Allen’s sportsmanship infractions and Coach Krzyzewski’s leave of absence due to medical issues. In evaluation of Duke’s less- than-stellar- or unexpectedly mediocre- performance this season, sportsmanship can affect both team chemistry and performance in games. According to Natasha Turner, CHS senior and Duke Soccer commit, sportsmanship is key to a team’s success in games for all sports. “Sportsmanship is important because you have to take ownership of your actions and have the respect of your teammates and fans. Without sportsmanship, a lot of things can go wrong within the team which translates outside of it in games,” said Turner. A win against top rival UNC on Thursday, February 9 led Duke to jump up six spots in national rankings to number 12 in the country with a 22-5 record (twenty wins and five losses). While the Blue Devils still have a lot to prove heading into the NCAA tournament season, this win may be just what Duke needs to fully recover from a losing streak and the consequences of sidestepping sportsmanship. You walk into the CHS library. To the left, you see an organized display of the newest books, seasonal decorations and craft-based materials: a creative and relaxed atmosphere. To the right, you see tables filled with students discussing a range of subjects and building on one another’s ideas: a vibrant, yet productive, atmosphere. Finally, as you continue forward, you see two smiling faces welcoming you into the library and asking about your day: Kara Watson and Eleanor Tierney. As the school’s Library Media Coordinator, Kara Watson keeps the CHS library functioning smoothly on a daily basis. Her qualifications include a Masters Degree in Library and Information Science. While Watson has devoted seven years of service to CHS, she previously worked at Chapel Hill High School for four years. Multi-talented, other jobs on her resume include everything from owning a record store with her husband to working as an acupuncture assistant. As with any work experience, maintaining the library comes with its challenges. According to Watson, it can be difficult to maximize resources with a limited budget. Helping students maintain a balance between productivity and relaxation in the library is also challenging. “I feel obligated to provide a space where students can get work done and do what they need to,” said Watson. On a typical day, Watson stays busy preparing for a variety of classes that utilize the library’s resources, ordering and processing books and meeting with teachers or numerous committees on which she serves. However, the focus of each day is the needs of students who come in. Eleanor Tierney works with Watson as a library assistant. Tierney is new to the library this year and previously served as a receptionist. 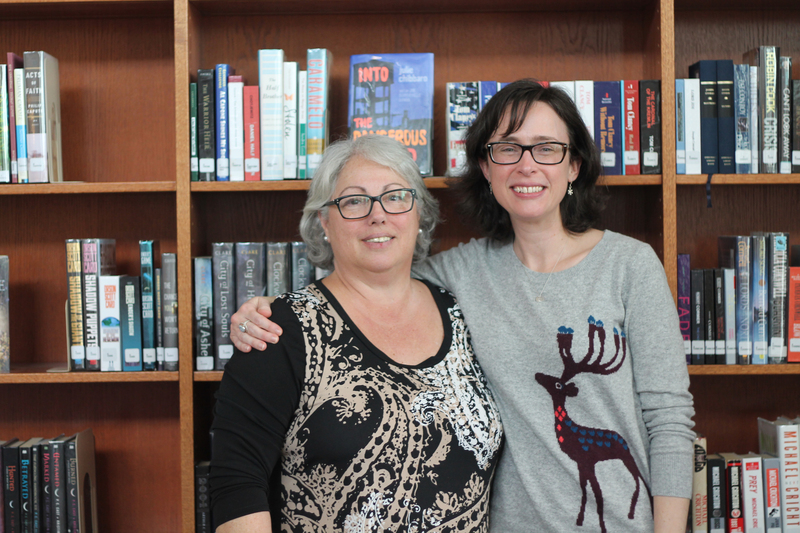 She joined the CHS support staff following an eighteen-year career at a middle school library in New York state. Tierney’s role in the library primarily involves serving the individual needs of students. She is also responsible for maintaining the organization and cleanliness of the library to create a positive and practical work space. Tierney (left) and Watson (right) pose in the library. Photo by Mireille Leone. A seasoned group of elected and appointed officials joined the Carrboro learning experience this fall. As an interactive component for their unit on elections and government, System Level teacher Melissa Barry invited several respected community leaders to speak to her class about real-world implications including division of power among various government levels, voting and occupational responsibilities. Mrs. Barry’s class of six students welcomed five guests in September, including Lydia Lavelle, Carrboro Town Mayor, and Dr. Jim Causby, Interim Superintendent of CHCCS. The guest speakers aided in students’ understanding of the difference between elected and appointed officials among numerous other political concepts. Two of Mrs. Barry’s students will vote for the first time this November. A goal of this program is to teach how one vote influences the lives of individuals and the life of the community at large. “What I look for as a teacher is: how can I make the concept as functional, practical and relevant as possible? 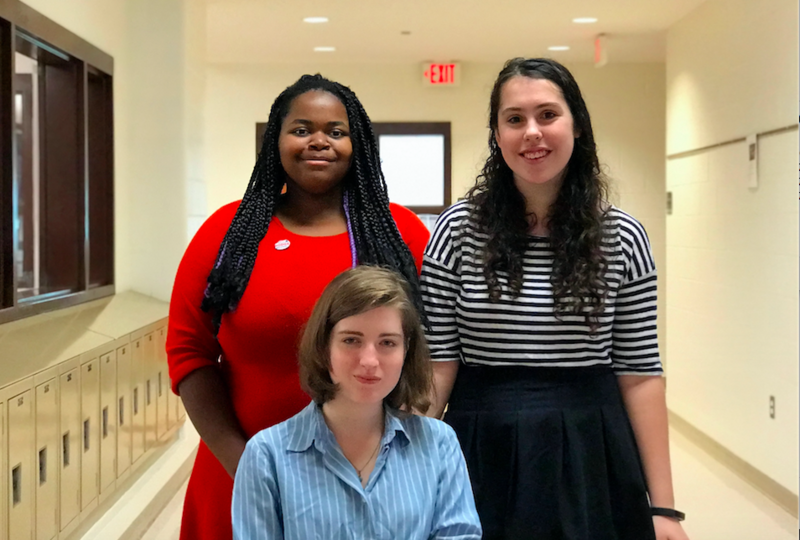 We want to help students understand that when they vote for a candidate, there is a ‘ripple effect’ that can directly impact their lives,” said Barry. Dr. Jim Causby enlightened CHS students about his connection to state and local government during his visit on September 9th. As superintendent, Causby was appointed under a four-year contract by elected officials on the local Board of Education. Causby explained that the role of a superintendent involves making decisions in regard to school buildings, classes and staff, further emphasizing the idea that voting for a candidate influences a wide array of people and functions. Senior Lucia Romano thoroughly enjoyed meeting and learning from all of the guest speakers. “I like when they talk about their jobs and what they do,” she said. Students generated a list of questions prior to Dr. Causby’s visit and were each given an opportunity to share their inquiries and practice their communication skills. 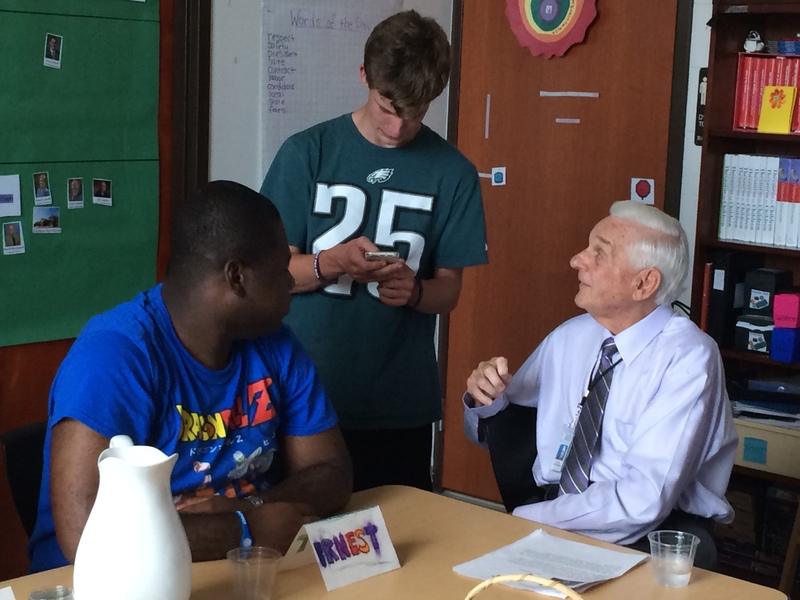 Causby responded to questions ranging in topic from job inspiration to favorite food, birthplace and even favorite NBA team from the 1970’s (response: the Chicago Bulls). In his fifth role as a superintendent, Causby advanced his career position to education administration after teaching multiple grade levels and coaching middle school basketball and track. Originally from Marion, North Carolina, Dr. Causby shared with Mrs. Barry’s class about his experiences working with school systems in 47 different states before joining the Chapel Hill-Carrboro community. When asked about his aspirations for change in the CHCCS school system, Causby didn’t hesitate to respond. “If I could instantly change anything with the wave of a magic wand, I would do away with the achievement gap – any inequities – to make sure everyone is treated fairly,” he said. Mrs. Barry’s class continues to serve as a model for active learning as occupational preparation and life skills are of central value in and outside of their classroom. To Barry, learning should be centered around preparation for life and community service.